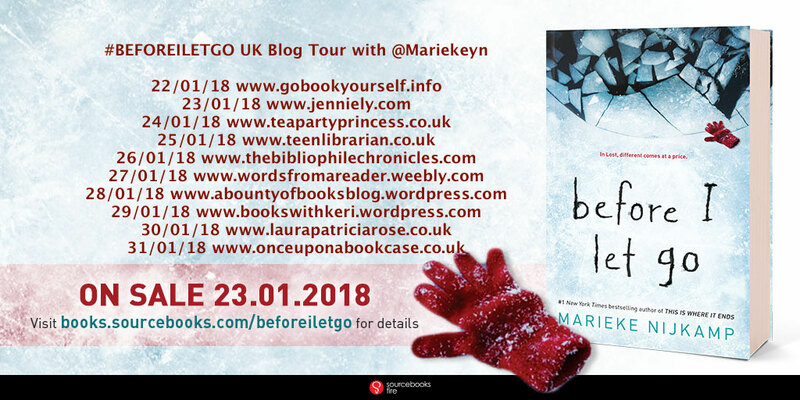 Welcome to my stop on the UK Blog Tour for Before I Let Go by Marieke Nijkamp! Read on for my review, the answer to Marieke's final question, and a giveaway! 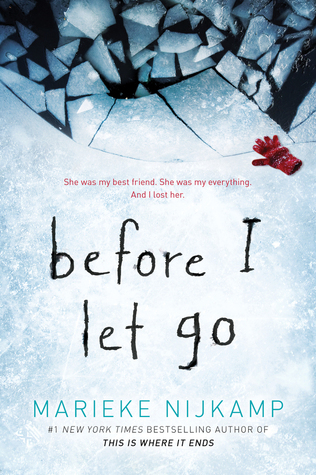 Before I Let Go by Marieke Nijkamp - Best friends Corey and Kyra were inseparable in their snow-covered town of Lost Creek, Alaska. When Corey moves away, she makes Kyra promise to stay strong during the long, dark winter, and wait for her return. Corey knows something is wrong. With every hour, her suspicion grows. Lost is keeping secrets―chilling secrets. But piecing together the truth about what happened to her best friend may prove as difficult as lighting the sky in an Alaskan winter... From Goodreads. I received this eProof for free from Source Books via NetGalley for the purposes of providing an honest review. I was such a huge fan of Marieke's debut novel, This is Where it Ends, so I was really excited to read her latest, Before I Let Go. And it's absolutely brilliant! Corey lived in small town Lost Creek, Alaska her whole life, until seven months ago, when her mum got a new job in Canada. She left her best friend, Kyra, behind, but always planned to come back and visit. Days before her planned return to Lost Creek, Corey receives a phone call to say that Kyra has died - and it looks like suicide. Completely devastated and disbelieving, Corey returns anyway to visit Kyra's parents, Mr and Mrs Henderson, and to attend the memorial. There, she finds that the small town who once scorned her beautiful friend as an outsider for having bipolar, now speak of her reverentially. Things changed in Lost Creek in the past seven months, and people who once wanted Kyra out of the town now sing her praises, and everyone has at least one of the paintings Kyra would paint during her manic episodes. Yet no-one, not even Kyra's parents, will fully explain to Corey what happened to Kyra. There are only the vague answers of "It was her time," and "It was meant to be." As Corey finds out more as the days go by what happened in the past seven months, she starts to wonder if her best friend's death was really suicide. This book. This book is so good. I loved it, but did I enjoy it? Not at all. The people of Lost Creek are not good people. I'm sure it's not true for all small towns, but Lost Creek is like small towns you see in movies, specifically horror movies; it's its own little world, and they have their own rules, their own way of doing things, and their own prejudices. Through flashbacks, we get to see how life was like in Lost Creak before Corey left. It doesn't matter than Kyra's great grandfather was one of the first settlers to Lost Creek, Kyra didn't belong, and they made no secret of the fact that they wanted her out. It was as if they thought her manic episodes would taint the town, or it was catching. People stared at her in the street, and wouldn't involve her in anything - no party invitations, no asking to join other kids for a coffee, nothing. Everyone knew what the town thought of Kyra, especially Kyra. So when Corey returns after Kyra's death, she is flabbergasted at the change in the town, and how they talk about Kyra. It's more than them coming to understand her, and thinking of her as one of their own. They venerated her. She was put up on a pedestal, and spoke about as if she were some kind of god. It was weird, but more than that, it was was creepy. I mean, really creepy! I found the people of Lost to be really disturbing, and I felt uncomfortable the whole time I read Before I Let Go. Especially with the constant repetition of the phrases, when talking about Kyra's death, of "It was meant to be," "It was her time," and "So be it." They mourn her, they celebrate her, but they're not surprised or shocked that Kyra took her own life, they don't act like it's a terrible thing that happened to someone so young, someone who was so troubled. And who says, "It was her time" about a teenage girl?! Especially when it's suicide?! Before I Let Go almost feels like a horror story, though it doesn't quite make it. But it definitely shows that people can be scarier than monsters. Not much happens in the book, however. It's mostly just Corey talking to various people she used to know, and how they're not treating her like an outsider because she left. And because she doesn't understand. She wasn't here, she didn't see what Kyra did for the town. They finally understood Kyra through her art (whatever that means, because I never fully got that), Kyra's art changed the town for the better through her art, and gave them hope. These conversations make up pretty much the entirety of the book, but with each conversation, Corey - and the reader - learn a little more, and the sinister undertones of the book get stronger. There's a subtle magical realism feel to the story that is present throughout, but I can't really talk about how without spoiling the story. Before I Let Go is interspersed with letters that Kyra sent Corey, most of which she didn't reply to. Kyra was having a bad time with her bipolar, and Corey not only wasn't there in Lost Creek, but she wasn't there for her by replying to her letters. Kyra must have felt so alone. She needed help, but the town was too busy being cultist, and Corey wasn't replying to or even opening her letters. I must point out that this isn't a book about bipolar. Kyra having bipolar is integral to the plot, because it's because she's bipolar that the town treated her one way, and then treated her another. If she didn't have bipolar, there would be no story. But it's not about bipolar. 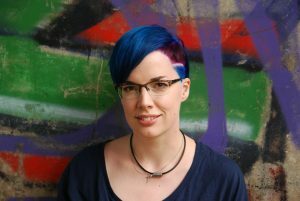 Through the flashbacks and conversations she was with Corey, and her letters, we get an idea of what Kyra's experience of living with bipolar is like, but she's not a narrator, so we're being told rather than shown. I don't feel I came to better understand what living with bipolar is like by reading Before I Let Go. But I don't think I was meant to, because, as I've said, it's not about bipolar, but a town's treatment of a girl who has it. I finished the book feeling angry. Angry - no, raging - at the people of Lost Creek, and their treatment of, Kyra, a girl who was ill and needed help. Really, the things they did. They used her, they abused her, and they are abhorrent. When it's finally revealed what had happened to Kyra, I was filled with repugnance, rage, and sorrow. Kyra was failed, in so many ways by so many people. She deserved more, and she deserved better. But I was also angry at how the story ended. Not with Nijkamp, not in the sense that the ending was a bad one or disappointing, because there is no other way this story could end. And that's why I was angry, because there was no other way it could end, that there are no other possibilities. I just can't begin to describe just how deeply my sadness goes for Kyra. After all she went through, after dying, and yet, that's how it ends. It's unbelievably heartbreaking, and just so wrong. Before I Let Go is a story that will really tug at you heartstrings. It's so emotional, but also really chilling and creepy, and I'm partly glad I've finished, just so I don't have to spend any more time with those people. Such a powerful novel, I think Before I Let Go may even surpass my love for This is Where it Ends. It's absolutely incredible; a definite must-read that will leave you desperately uncomfortable, and crying out for answers. Thank you to Sourcebooks via NetGalley for the eProof. You’ve now got two incredible YA novels out in the world. What’s next for Marieke Nijkamp? Well, I edited an anthology that’s coming out in September: Unbroken: 13 stories starring disabled teens, with all the stories written by disabled authors. It’s a wonderful collection of tales, and I’m so honoured to be working on it. More than that, I’m super excited to share these characters and these stories with the world! And then, oh, there are story ideas. Of course there are! But I won’t quite share those with you, yet. I don't know about you, but I'm really looking forward to Unbroken! It sounds amazing! And now time for the giveaway! Enter below to win a hardback copy of Before I Let Go. Enter to win one hardback copy of Before I Let Go by Marieke Nijkamp. Giveaway will close on 7th February at 12.00am. The winner will have 48 hours to provide their mailing address in a reply to my email, or a new winner will be chosen. Winner's mailing address will be passed on to my contact at the publisher, who will send out the prize. Do check out the other stops on the tour - and leave a comment for extra entries in my giveaway! After reading your post, part of me says do I want to read this? as it sounds like a bit of an emotional rollercoaster yet another part of me is really intrigued and curious and I really enjoy books that are a bit different so I am going to enter and should I be lucky another to win I will get to find out what it is all about! Sounds really good, I'll keep an eye out for it! I really loved This Is Where It Ends, but gosh it sounds like we are in for another difficult read with this one, maybe even more so, but in a different way? But the anger you talk about feeling in particular makes me want to read it? Not sure if that makes sense. I met Marieke very briefly at an event this summer and that got me excited for this book, but this has made me anticipate it in a different way. Also omg I want the disability anthology!